Bad Kleinkirchheim school ski trips: Ski in Bad Kleinkirchheim – the home of ski legend Franz Klammer! The skiing in Bad Kleinkirccheim is simply fantastic! Whether you are a novice or a hardened veteran you will be able to find your own space in this beautiful part of Austria. A great example being the longer than usual nursery slopes that keep beginners going down the hill for longer, giving them a very early taste of being ‘on the mountain’… or the 3.5km Franz Klammer World Cup run for those who really want to challenge themselves. Bad Kleinkirchheim school ski trips certainly give you plenty of variety in terms of slopes. Bad Kleinkirchheim ski resort has great areas for beginners including some longer than normal “nursery” slopes which give students a very early taste of being “on the mountain”. Inters and advanced are also very well catered for. So from nursery through to the 3.5 km Franz Klammer World Cup run, there really is something for everyone. So why does Bad Kleinkirchheim ski resort work so well? We guess that it has a lot to do with the people… The main man over there is Max and he basically makes sure everything runs perfectly! Depending on which hotel you stay at ski fit will take place either at the hotel, which is nice! Or at the foot of the slopes, which is also great. The instructors are on hand every morning to greet the groups and most of them stick around at lunch time as well. BKK is a fabulous resort situated in the famous Corinthian Mountain range. 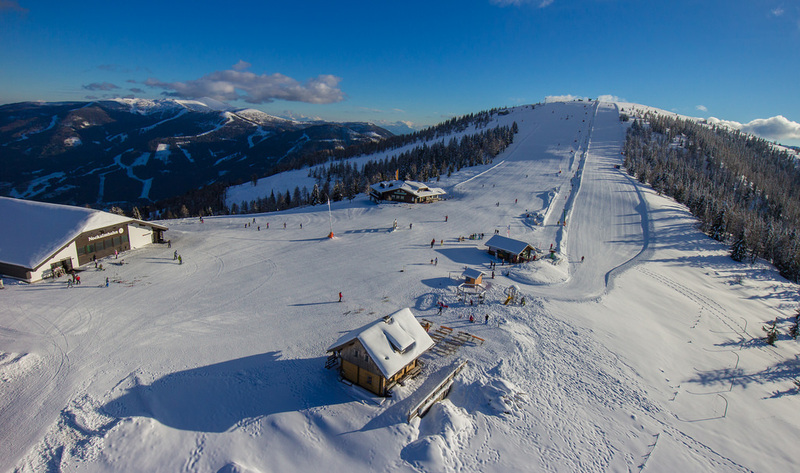 There is over 100km of downhill skiing and the 27 pistes are served by 25 lifts. The skiing genuinely offers something for everyone from the beginner to the seasoned veteran. With night skiing also offered, there is something for everyone! 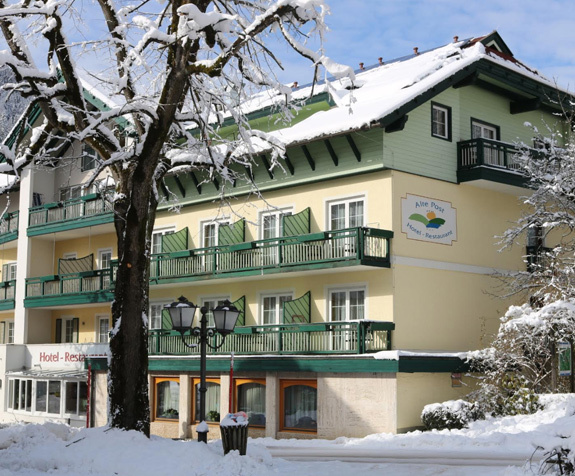 Hotel “Alte Post” is a 4-star hotel at Feld am See in the region of Bad Kleinkirchheim. Newly renovated in 2010, the Hotel Alte Post, the Carinthian inn on the award-winning village square in Feld am See, is the Palle Family’s original building. Warm hospitality is taken seriously here. It has a new entrance and lounge area with own reception, fireplace lounge, elevator, apartments with separated sleeping room, spa area with finnish sauna, steam bath and infrared cabin, and a children’s playroom. Depart from school and head to Dover where you will cross the channel to Calais travelling to the village of Seeboden in Austria. Make sure you take your favourite DVD’s with you to enjoy throughout the journey! The Camp RoyalX Hotel is located at the edge of Lake Millstätter and has easy access to all the facilities in the village. Built only a few years ago the accommodation is very modern and the facilities superb. On arrival the group will have time to explore the village and acclimatise themselves in the comfortable surroundings of the hotel. The group will take breakfast and dinner in the hotel’s buffet style restaurant with a packed lunch. This should ensure that even the pickiest eaters will find something they enjoy! Your group will start each day with a buffet breakfast at the hotel before you take the short drive to the stunning ski resort of Bad Kleinkirchheim, BKK. The Ski school will be waiting to greet you at the ski rental shop. All information is pre – supplied and your equipment will be ready and waiting so you’re not hanging around. From here you will walk to the meeting point for ski school. Your well earned lunch will be eaten on one of the comfortable restaurant terraces on the mountain. Return to the slopes and enjoy the rest of the day. At the end of the day, why not meet up at one of the mountain restaurants for hot chocolate? As with all areas of activ4 programmes, evening entertainments will be carefully planned for your group and after the first day skiing you will settle down for a group quiz. Head out for another full day of fun in the snow. The resort of BKK has 100km of beautiful tree lined piste to explore. The 5 main lifts provide excellent access to the 15 other lifts and 100km of piste. 97% of the mountain is covered by the 800 snow cannons and BKK also hosts a round of the Audi FIS Ski World Cup. Tonight will definitely be the time to opt for a soak in the hotel’s beautiful indoor Swimming pool. By now everyone will be starting to feel they are making good progress. Today might be the day for all the groups to meet up at the top of the mountain outside Panorama Restaurant Knock IN and admire the stunning views of the Southern Alps. This evening you can round off your day with a movie night. Another day and out to make the most of the snow. Try challenging your instructor to a race; the practice could come in useful tomorrow! Tonight would be a great night to swap dinner at the hotel for a fantastic Pizza! The final day of skiing! Often the best day as everyone has made fantastic progress and the instructors will keep everyone amused with time trials and slaloms! At the end of the day everyone will meet at ski school HQ and the instructors will present certificates and prizes. Unfortunately, all good things come to an end and after dinner you will set off on the coach journey home. The tour officially ends when you get back to the UK, but with a trip this great we are sure that it will live long in the memory.